Eneclann > Newsletters > 14th of April: Latest Eneclann Newsletter. 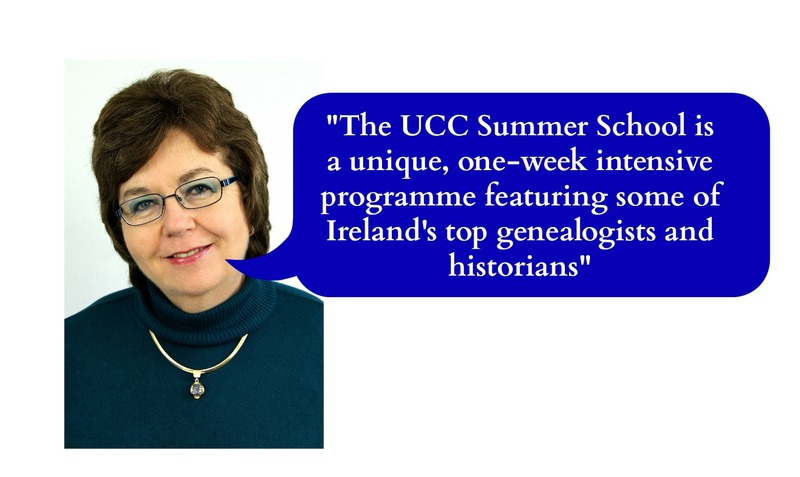 The UCC Irish Genealogy Summer school. 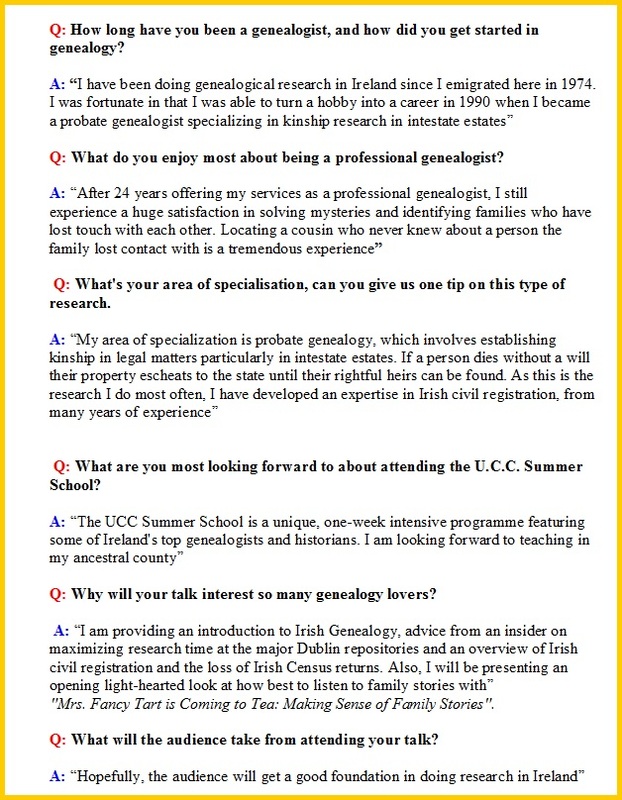 We caught up with professional genealogist and director ofheirsireland.com Eileen O’ Duill, who will be giving a number of interesting talks at the Summer school and asked her to give us a little idea of what she is all about. Sunday 29th: 6.00pm:“Mrs, Fancy Tart is coming to Tea’- Making sense of Family stories. 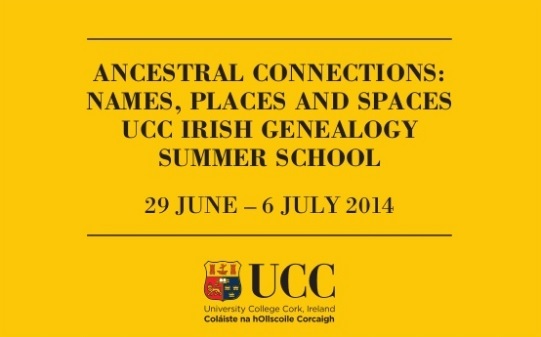 Monday 30th June: 9.30am-10.45am:Introduction to Irish Genealogy: Where do I start ? Monday 30th June: 11.15am -12.45am:Researching in Ireland : Planning is the key to success. Monday 30th June: 2.00pm-3.15pm:Births,Marriages and Deaths-Irish Civil registration-The sad story of The Irish census. Tuesday 1st July:Dublin 30 June: 1922 Did everything blow up? Family History is very much a “one-man-band”, and opportunities for Continuous Professional Development are hard to come by. With this in mind, Eneclann and Ancestor Network have partnered, to create a regular series of expert workshops on key topics. From April 2014, we will hold monthly workshops in Trinity College Dublin, and the National Library of Ireland. These are free events, open to all family historians and independent scholars, but attendance is by ticket only. The workshops kick off onThursday 10th April, and Saturday 12th April, with Eneclann’s ownFiona Fitzsimons speaking on how to trace records of children raised in care from the 1840s to the 1990s. On Thursday 24th April 2014, visiting academicDr. 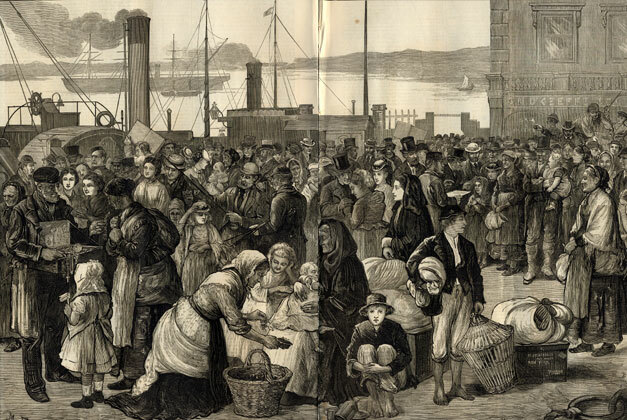 Liz Rushen will present a workshop at the NLI on womens’ emigration to Australia in the 1800s. Dr. Rushen a Research Fellow at Monash University in Melbourne, Australia, is the former Executive Director of the Royal Historical Society of Victoria. She is the author of fifteen books, three of them co-authored with Perry McIntyreQuarantined (2007)The Merchant’s Women (2008) andFair Game: Australia’s first Immigrant Women (2010). Her most recent book,Colonial Duchesses: the migration of Irish Women to New South Wales before the great Famine, will be launched in Ireland in April by the Australian Ambassador. Liz Rushen’s work focuses on the 1830s to the 1850s. They were decades in which decisive changes took place in the demography of the eastern colonies of Australia. Potential emigrants were attracted to the British government’s schemes, but there were long-lasting tensions between the government’s commitment to imperialism and the wishes of influential colonists for self-determination. The women immigrants were very often caught in the middle. Have a listen to Cormac ag a Cúig Cruinneog,and his interview with Eneclann spokesperson Fionnuala Holohan,onRaidió na Gaeltachta on Saturday March 29th,as they talk about the “Genealogy Event”in Limerick this August. 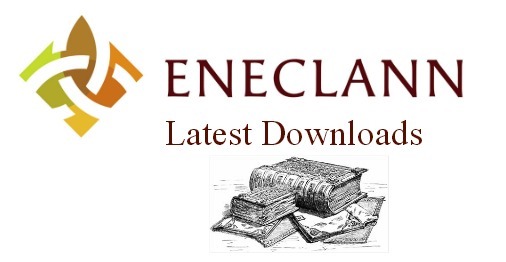 Latest Downloads available at Eneclann. You can view and purchase all of our latest download releases over on pur website. In Irish family history research, you will sometimes find odd or unusual words and terms cropping up in the documents you use. Many of these words are ‘loan-words’ which passed from Irish or French, into the vernacular in Ireland in the 1600s, 1700s and 1800s. These words can cause confusion over what exactly is being said. This is especially the case when a word has developed exclusively in an Irish context, and its use has changed over time, obscuring its original meaning. Here are some typical terms that you’re likely to find in common use, particularly in Irish newspapers and legal & court records. An Irish Jacobite irregular soldier. The name ‘raparee’ is thought to have been taken from the Irish ‘rapaire’, a type of pike. By the close of the Williamite wars in the 1690s, the term had become synonymous with the term ‘tory’, meaning bandit. By the 1700s and 1800s raparee was still used in the province of Ulster to denote criminals.In the late 1800s ‘raparee’ was sometimes used to describe a hard landlord, particularly during the Land War (1880s-90s). In England and other European countries they had bandits and highwaymen. In Ireland, we knew them as Tories. Supporters of the 1798 Rising, their short hair showed their sympathies with the French Revolutionaries. 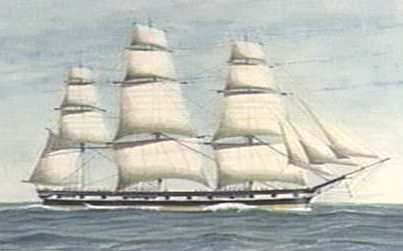 The term is also used to indicate participants in the Rising who were transported to Australia. In the 1800s this term is frequently used in newspapers in a derogatory sense to indicate a ‘political rabble’. Thought to have derived from the Normans, from the word for fighter – guerrier. It indicated a common soldier. This term has survived into modern vernacular English in Ireland, where it’s used to indicate a lout or thug. This entry was posted in Newsletters and tagged 1930'3 how to Trace your roots, advice, archive, competitions, email, Eneclann, Family History, findmypast, Fiona Fitzsimons, Genealogy, genealogyday2014, Ireland, Irish, news, newsletter, online, publications, research, Research experts, subscribe, subscription.